I have been semi-facetiously referring to Wilfred as having a mythology, and even tweeted about tonight's episode being as jam-packed with myth-arc as the finale of season one of The X-Files. But in skimming Alan Sepinwall's review of tonight's episode, he said that the show's producers actually claimed Wilfred had a fully-fledged mythology. I have to say, I'm a little amused by this. I mean, the mythology, at its core, has to be about what Wilfred is and why Ryan sees him as human, and I mentioned early on that the answers to those questions would also answer the question of what kind of show Wilfred would become. In that respect, the show's producers claiming to have the answers should make that idea better. But I'm not sure the answers to that to come directly from the show. Seeing Ryan ask Wilfred “Why are you here?” demands that the question be answered on the show, directly, by the characters. I'd almost rather have it answered obliquely by the show's behavior. But, it's fair to say that I developed that theory on the grounds that Wilfred was a comedy and that comedies, even less than dramas, don't need a damn mythology. But this is the direction that Wilfred is going, and given that I'm wary of its move in that direction, I do have to admit that it's doing it fairly well. The biggest reason for Wilfred's dramatic success in the last few episodes has been that it actually wants to push Ryan's character development. Throughout most of the season, Ryan has been the straight man. He has been primarily a comic foil for Wilfred, who manipulated him into learning whatever random, pointless lesson needed to be learned before the big reset. But that reset hasn't been happening lately. Ryan's resolution to return to law to help Jenna is the biggest and most important example. Ryan, then Wilfred, worry about the slippery slope of Ryan's return to law. He was, after all, evil, and if he starts that again, even for the right reasons, then where will it end? In true Wilfred fashion, this happens quickly, almost as a morality play, and he does, in fact, end up ruining everything. As the season ends, Wilfred has lost his memory, Jenna is ready to marry Drew while believing she's pregnant, Ryan's sister has broken up with her husband, and Ryan discovers that the door to his hang-out basement with Wilfred is simply a closet. In other words, the episode and season ends with everything up in the air. This seems ballsy, but without coming down on an answer for any of those things, it's hard to get too excited. Every single plot thread could be returned to the status quo, or every one could change for the better. And this is something of a tradition, I will grant, but it means I'm not going to spend too much time getting excited about season two. Still, other than my consistent recent complaint that the drama and occasional darkness have been trumping the comedy that the initial episodes had, it was quite good for what it was. Seeing Elijah Wood play the intellectual badass, especially after so many episodes as a wavering fool, was a lovely change of pace. 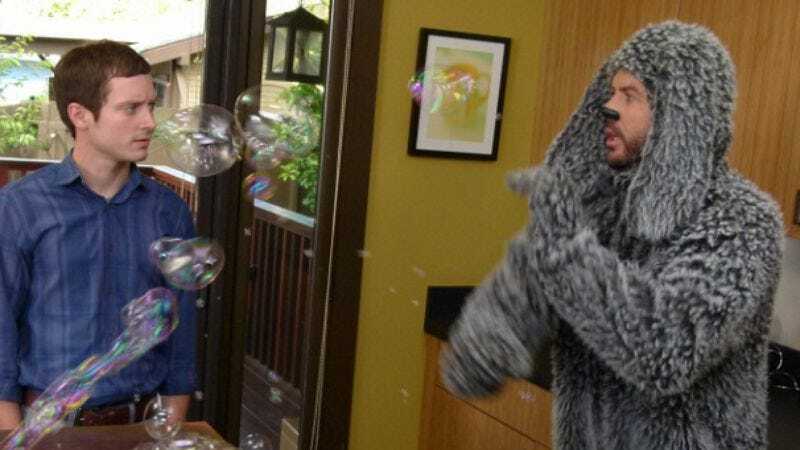 None have shown the wildness of the premise more than the hospital episode, “Respect”, and no scene has stuck in my head more than Wilfred in the rain on the roof, movie allusions or no. It may have had the most subtle guest turn, from Rashida Jones, but that may have also helped it be a better episode.